Finally opened my rusty heart. Hadn’t known it was closed, although all evidence pointed that way. For several years, I eschewed invitations to family holiday parties hosted by friends because they made me miss my own family and the days back when, every holiday, my house was Celebration Central. Why did I say yes this year when Donna invited Al & me for Easter dinner? I didn’t think about it, just did not shut down as per usual when the words “family” and “get-together” are mentioned in the same sentence. As I filled an Easter basket with goodies, I thought about this new thing I was doing. How would it be, seeing grandparents, parents, children and grandchildren? Would I be sad? Would my heart seize? I was not and it did not. I have known this family since my own boys were small. 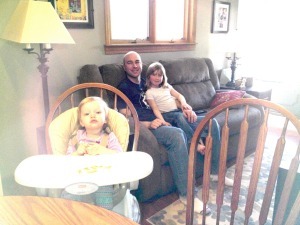 That’s Patrick and his daughters: Juliette on his lap and baby Lilianna in her chair. Pat and my son Mike were great pals. When I remarked to Donna’s sister that we hadn’t seen her in too many years, maybe since the cruise, her husband piped up to say they’d seen me up at the cottage not all that long ago. Yes, I remembered. That was the last time I danced on a chair. So it was a little while ago. We’d all matured, some more than others. Dan had a devilish gleam to his eye. I blushed and shook my head at how silly I had been after one too many glasses of wine. Even full of wine, I remember walking after midnight with Donna to the dock. We settled back to watch the stars, Stony Lake pooling under us, surrounding us, stars from the sky reflecting on the water’s surface. So many stars. Like heaven opened up and shook out an extra handful just for us. Yesterday, four generations gathered, two dozen in all. We knew every face, every story. These were friends who had turned into family a long time ago, without me noticing. But my heart noticed. And Celebration Central turns out to be located within the heart as well as around the dinner table. What a wonderful day. 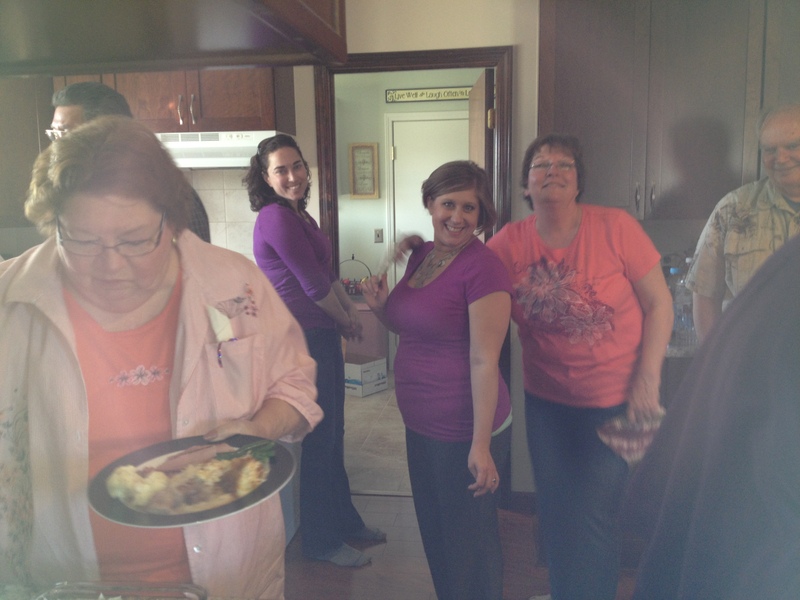 You are super-organized and a fabulous cook and hostess:) I loved seeing all your family again and catching up. Also talked to Melody’s brother, who is just so sweet!! We love being honorary Holiens:) And ahh, Stony Lake, not sure which is prettier, the stars at night or the sun going down over Lake Michigan. I could watch sun set over big water every single night of my life:) But it’s even better sitting on the beach. New friends…it was easier when I was younger. You’re right, Sharon, kids help create so many friendships.